You know something’s truly funny when you’re laughing out loud at it while you’re completely alone. Not since my binge-playthrough of South Park: The Stick of Truth on the world’s clunkiest laptop has a game brought me as close to tears Not a Hero, set to release on May 7, did. The upcoming title from the versatile Roll7, known for both OlliOlli and OlliOlli 2: Welcome to OlliWood, is equal parts action-packed, hysterical, mechanically sound and downright dumb. Now granted, I have the world’s most ridiculous sense of humor, being that I’m the king of the “One-Man Inside Joke,” so there’s an overwhelming sense that this game was made specifically for me. Of course, it’s obvious that Roll7 wouldn’t waste their time making a game for one bizarre, lonely member of the games media (though if you do, you know where to find me), but I digress. 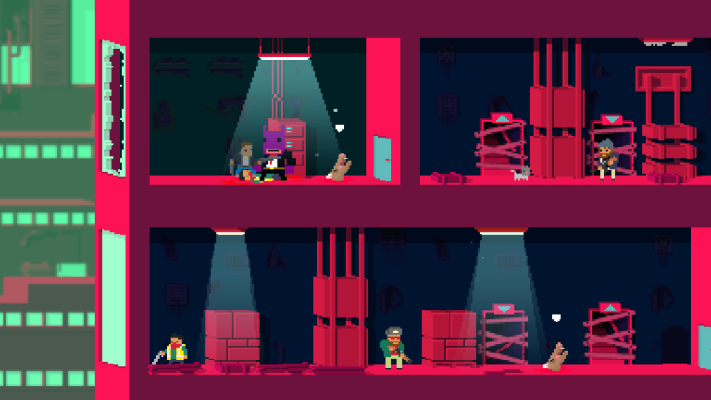 If you’re someone who wants to laugh at nonsensical jokes, shoot some dudes in the face, admire gorgeous pixel art, or if you simply love Devolver Digital-published titles, Not a Hero is most definitely the game for you. Before diving into all of Not a Hero‘s bizarre intricacies, let’s start from the very beginning and explain its premise. Yes, that’s clearly the standard way to write about a given game prior to release, but I just want to make sure that you’re still paying attention after the first 200 words. Not a Hero tells the story of BunnyLord, a potential mayoral candidate who claims that the world will end in a fiery blaze if he isn’t elected. Players take the role of the members of his crew, the BunnyLord Fun Club, as they run, slide, and shoot their way through the cities criminals to set their leader up for success. The moment to moment gameplay utilizes a pretty unique 2D cover system that allows players to slide in and out of the background, thus rendering Not a Hero‘s perspective somewhere between a traditional two-dimensional perspective and 2.5D titles like LittleBigPlanet. 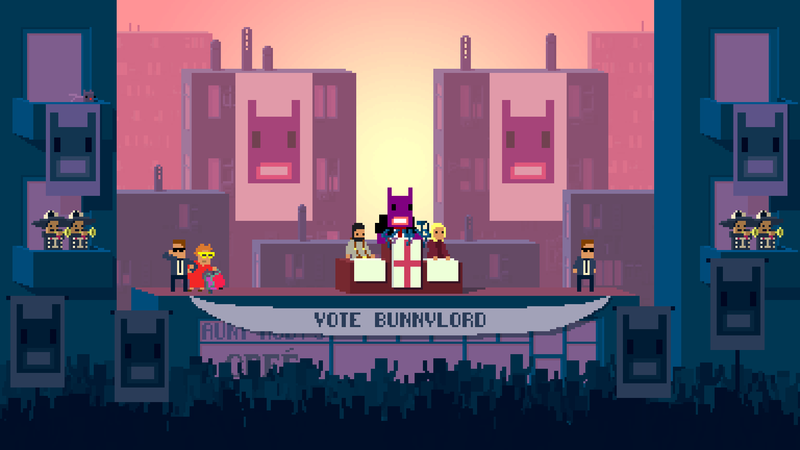 Every level involves some sort of overarching goal that aids BunnyLord’s campaign, be it turning on a massive billboard or defeating a longtime foe that rejected a cake of friendship, but smaller challenges exist for completionists. None of these challenges in the first section, Vodkaville, are particularly difficult, as I was able to 100% this segment of our complete build in a mere fifty-three minutes, but their presence is definitely appreciated. Let’s get this out of the way too: Not a Hero currently runs at a locked 30 FPS on PC, no matter the power of the rig, and it genuinely doesn’t matter at all. So yeah, Not a Hero‘s gameplay is fast-paced, action-packed, and exciting, but that’s not what’s important here. Yes, you could definitely argue that gameplay is a game’s single-most important factor, and you’d be perfectly correct, but the way Roll7 has blended that gameplay with a general sense of ridiculousness is what makes Not a Hero special. BunnyLord’s dialogue is hands-down the dumbest I’ve ever seen in a video game, and I absolutely mean this in the best way possible. Whether he’s discussing charts the demonstrate how awesome his Bunnycopter is compared to a dust-bunny, sub-par wombat-flavored milkshakes, or how people from Spain are awful, there’s always something to enjoy during the cutscenes before and after each level. When you take into account the hilarious nature of the characters and over-the-top nature of every gameplay moment, an overarching theme of hilarity starts to emerge that is hard to not be drawn towards. Over the course of the first seven stages, players gain access to four unique characters, each with their own personality and gameplay quirks. The final character, Jesus (not like Bible Jesus, but the kind that sounds like you’re saying hello to a Greek god), is by far my personal favorite individual introduced in the initial third of Not a Hero. A BunnyLord Fun Club intern, Jesus is tempted to dry-hump everything in sight, so much so that his standard standing animation shows him thrusting his pelvis repeatedly. His dialogue, accent, in-game super-speed, and twirling execution maneuver make every moment spent with him over-the-top in a way that not many games manage to achieve. Contrast Jesus with Cletus, a Scotsman with a blowback shotgun, the mask-rocking Australian Steve, and the always-dashing Samantha, and it’s easy to fall in love with this lovable band of murderous vagabonds. Roll7 should be commended thus for for their ability to craft a theme and not only stick to it, but use it to elevate the entire title. While Not a Hero‘s tight controls, unique take on perspective, and slide-to-cover mechanic would make for an entertaining side-scrolling title, I’m convinced that its humor and inability to take itself seriously are what bring it to another level. Sure, murdering 4 enemies in five seconds is a challenge that could hook completionists in any game, but the fact that these deaths involve a weird character flying through windows, sliding through pixelated blood-pools, and spouting of hysterical quips makes every task worth completing. As someone who has to manage a great deal of their time, I can appreciate the fact that Not a Hero creates a world that’s so fun to be in that it compels the player to do everything imaginable. Oh, and it’s worth mentioning that completing every challenge in a short period of time made everything a hell of a lot more fun. To be fair, I did spend roughly an hour with Not a Hero during PAX Prime 2014 and PAX East 2015, so I did have a fair amount of practice, but we can forget about that for the sake of my last sentence, right? When you consider the sheer amount of quality titles they’ve put their name behind, as well as their openness with YouTubers, the media and the average consumer, it’s hard not to admire what Devolver’s doing for the industry. It’s gotten to the point that when a Devolver game is released, you pretty much have to stop what you’re doing, pick up the controller or the mouse and get right to playing. Not a Hero continues this trend, as those looking for a game to challenge them, make them laugh and fill them with glee could do a lot worse.